I recently wrote a review of Mel Gibson’s 2006 film Apocalypto, which I think is one of the coolest and most passionately movies I’ve ever seen. Since then, Gibson has gotten into all sorts of trouble, and his career has certainly suffered for it. While I can’t get behind anything he’s said or done, I’m still a huge fan of his work and it was unfortunate to see him fall so far off the radar. 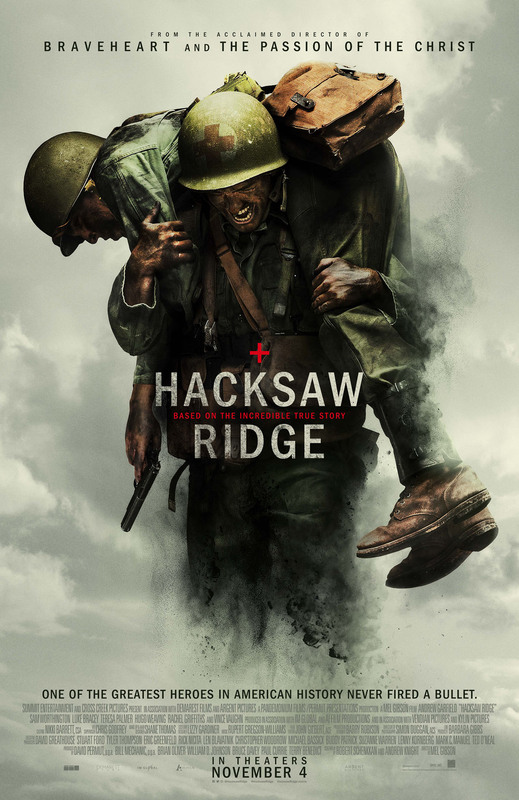 After 10 years, Gibson has returned to the director’s chair with Hacksaw Ridge, an anti-war film that’s based off an incredible true story of one man’s courage and beliefs that are often at odds with the rest of his brothers in arms. All I can say is that this is a very strong return which will hopefully remind Hollywood and movie goers everywhere about an intensely strong talent that has been missing from the spotlight for the past decade. Desmond Doss (Andrew Garfield) is a young man living in Lynchburg, Virginia during World War II. Throughout the years of the war, he sees his friends and neighbors leave to enlist and often times never return. When his brother enlists, much to the anger of his WWI veteran father (Hugo Weaving), Desmond also enlists as a conscientious objector with a goal of becoming a field medic and never picking up a weapon. As Desmond leaves his family and his love of his life, Dorothy (Teresa Palmer), behind he finds that the Army isn’t quite as accepting as he thought. After jumping through legal hoops and defending himself against his platoon’s leaders, Sgt. Howell (Vince Vaughn) and Cpt. Glover (Sam Worthington), he and his brothers in arms are shipped off to Okinawa to a strike point known as Hacksaw Ridge. There, Doss is witness to the brutal horrors of war and the violence one man can inflict upon another, but his strong beliefs and courage never waver and he becomes a truly respected hero of WWII. There’s many different ways to go about telling a story. You can jump right into the action or you can take your time and build up the characters and motivations before really getting into things. There’s no objective right or wrong way to do this, but the writers and Mel Gibson really landed how to tell the story of Hacksaw Ridge. The best way to describe it is that the story is broken up in two halves. The first half of the movie show Desmond at home with his family, his decision to enlist, and his time defending his beliefs at basic training. 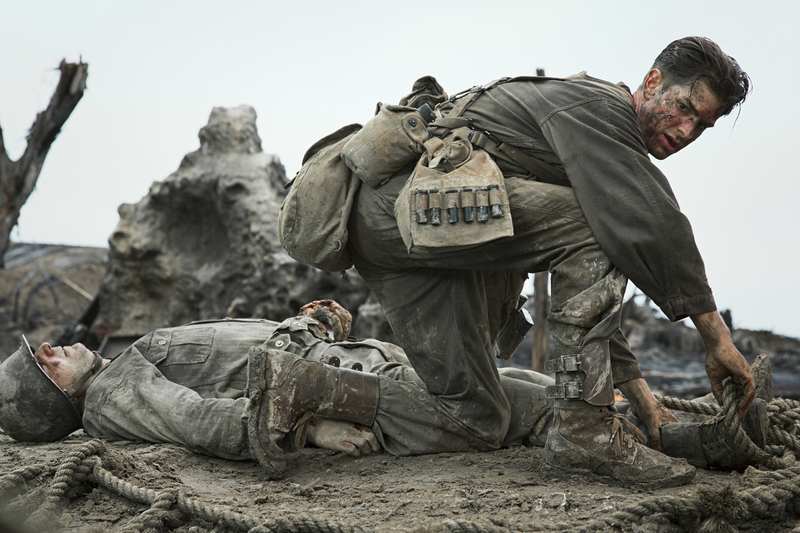 The second half of the movie is the battles and other heroics at Hacksaw Ridge. The second half is such a devastating experience that is guaranteed to exhaust the viewer, but it wouldn’t have had that same impact if time wasn’t spent building up Desmond’s character and his relationship with his family, peers, and superiors. When something terrible happens to a character in this movie, I felt a physical reaction because of the previous half of the movie turning a fictional character into what felt like a real person. This is a war film at its most effective. I’ve seen from some critics that Hacksaw Ridge glorifies extreme violence. While the violence may be extreme, it never glorifies it. There was no time during the battle sequences where I thought an act of violence was cool. That’s not what this movie is about, and by the end I felt like I couldn’t take that final trip up the cliff and face the horrors again. This is a movie about two conflicting themes being met at a place that is hell on earth. Desmond’s pacifist and religious beliefs seem to have no place on the battlefield, and you’d expect these beliefs to change once he saw what his fellow humans are capable of. Gibson shows war in a straightforward and unflinching way which is reminiscent to the violence that is seen in Saving Private Ryan. Sure, there’s really brutal incidences that receive a lot of focus, but this was for the purpose of showing a religious individual faced with a situation that can be seen as entirely godless. I always say that the writers are nothing without the actors and the actors are nothing without the writers. It’s a symbiotic relationship that walks a fine line with the director present to make sure everyone stays on track. Here we have actors all performing at the top of their game. Andrew Garfield seems to completely become Desmond Doss and Oscar consideration has to be given to Hugo Weaving for his small but unforgettable performance. Vince Vaughn gets more respect from me as well along with Sam Worthington in a career best performance. These are the names that stick out when I think of Hacksaw Ridge, but the rest of the cast also bring their best no matter how small the part may seem. A realistic movie requires realistic and believable performances and they radiate from the screen in the movie. Hacksaw Ridge is a confident and impressive look at the horrors of war and is among the best and most powerful war movies ever made. The performances stand high amongst the carnage and the themes tower right along with them. This isn’t a movie about religion, but more so a movie about beliefs and conviction and the sacrifice it takes to uphold them. This is a masterwork in the genre of war and quite simply one of the best movies of the entire year.